Instrumental improvisational music for the mind, body and soul. The tunes I wrote for Sound of Mind are a reflection of not only my beautiful and gifted friends in the band but also of the many and varied styles and settings I have worked in as a bassist for over 20 years. 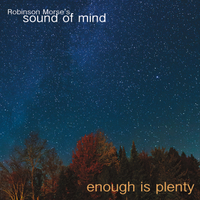 From the big band music, jazz, soul and funk to rock, electronic-inspired hip-hop and world musics I have been fortunate to have played, Enough is Plenty is my homage to rhythm, melody and harmony and the great lineage of American music. So please close your eyes, open your heart and mind, listen and enjoy!